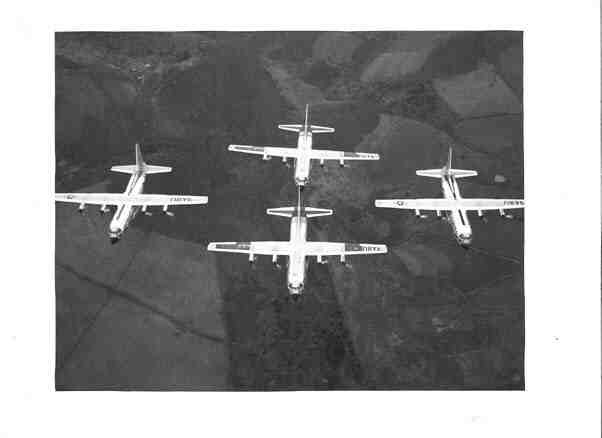 One of the most interesting stories in C-130 lore is that of The Four Horsemen, a Tactical Air Command aerial demonstration team that came into being during the first years of C-130 operations. The team performed public demonstrations at military air bases throughout the world in the 1950s, demonstrating the tremendous manueverability of the new tactical transport they flew. Their performances were so impressive that they often stole the show from other teams, particularly the Air Force's own Thunderbirds. Prior to the advent of the C-130, military transports had a reputation for being slow and sluggish. The reciprocating engine powered airplanes from which the first C-130 crews came were just that, and the transistion into the Jet Age brought the crews into a new realm where they not only had a powerful airplane capable of speeds in the fighter range, its hydraulically boosted flight controls allowed manuevers that were previously thought impossible in a transport. The crews of the 463rd Troop Carrier Wing at Ardmore AFB, Oklahoma talked among themselves about how manueverable the airplane was, and what possibilities it afforded. At the time, TAC C-130s were a common sight at Campbell Army Air Field, where the 101st Airborne Division was stationed. One day the scheduled airdrops were cancelled because of high winds on the drop zone, but four crews from the 774th Troop Carrier Squadron decided to use their training time for some intricate formation flying. Close formation flying was the order of the day in troop carrier squadrons from World War II into the early 1960s, when the in-trail formation was adopted. 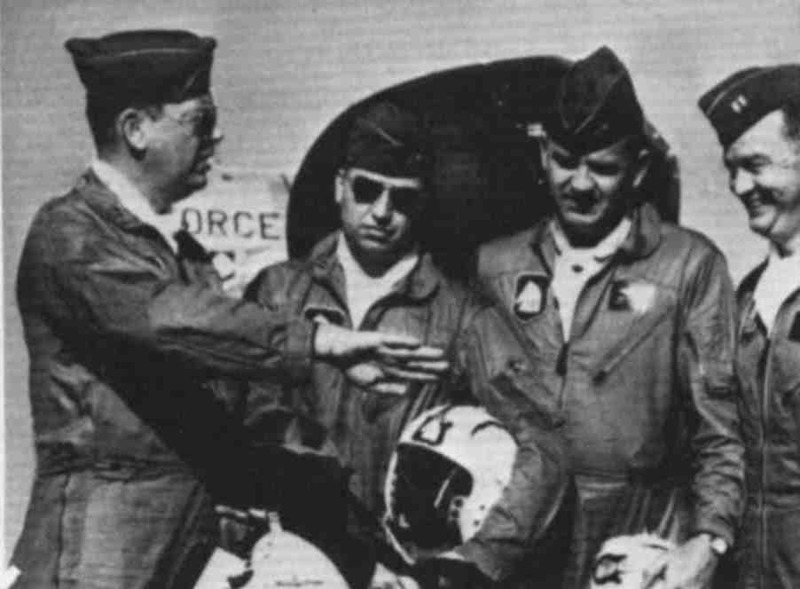 The four 774th pilots, Captains Gene Chaney, Jim Akin, David Moore and William Hatfield, were all veteran transport pilots, and very proficient in close formation work. They decided to do some experimenting - they took off at 5-second intervals then joined up for several low-altitude passes down the Fort Campbell runway. Those who witnessed the manuevers from the ground were very impressed. Another stand-down a few days later allowed them another opportunity to practice. The 774th's experiments were just before the 314th Troop CarrierWing at Sewart AFB, Tennessee was scheduled to begin replacing its C-119s and C-123s with the new Hercules. Word of the intricate formation flying had reached Tactical Air Command Headquarters, so the four crews - who were now calling themselves "The Four Horsemen" - were sent to Sewart to put on a demonstration of the new airplane to the crews who would soon be flying the airplane. It was an impressive performance. As a result of the Sewart demonstration, the Horsemen were sent to other USAF bases throughout the United States, as well as Europe and the Far East, to demonstrate the capabilities of the new C-130 that was beginning to make its appearance throughout the world. Their routine consisted of a formation take-off in a diamond formation, followed by a steep climb that would put them at 1,500 feet at the end of a 10,000-foot runway. 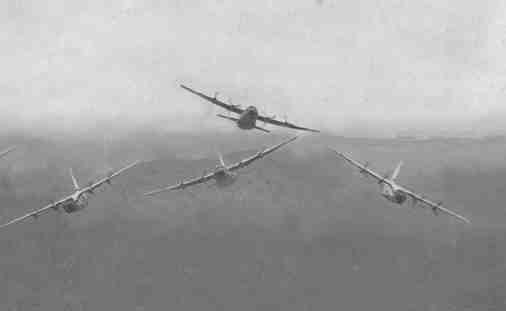 In the diamond, the two wingmen maintained a close formation with their noses slightly above and even with a row of rivets on the lead airplane's wings. Slot-man Bill Hatfield kept the upper third of the lead airplane's tail fin in his windshield, thus putting him above and out of the propwash. From the diamond, the team would go into the "arrow," the in-trail formation seen above. From the arrow they would go into "arrowhead" as the trailing airplanes came up alongside each other to make the "feathers" at the end of the leading airplanes' shaft. The 20-minute show ended witht the diamond coming over the airport and executing a bomb burst (below) followed by a reforming of the diamond for a pass down the runway. They would turn into the traffic pattern and move into echelon, with each airplane landing right behind the other - the lead airplane would still be on the runway when the slot man touched down. While the team's manuevers were impressive, they were not "aerobatics" in the technical sense, but were rather examples of tight formation flying and changes of position, all done at low altitudes. This is not to say that the Hercules has never been flown through aerobatic manuevers; it most certainly has. The Horsemen refrained from true aerobatics in their demonstrations because the propellers tended to react when the airplane was coming down the backside of a loop or during recovery from a roll. So, they concentrated on flying various tight formations, sometimes at wing-tip to wing-tip. The team applied for official designation as a USAF aerial demonstration team, but the application was denied because of mission requirements. Unlike fighter squadrons, whose peacetime mission is confined to training, troop carrier squadrons in the 1950s and 1960s were quite often used on operational missions and there just were not enough airplanes to spare. The era of the Horsemen was in the late 1950s, and the pilots were then men in their thirties. Of the four aircraft commanders, Gene Chaney and David Moore have passed away. Jim Akin and Bill Hatfield are still around, and Bill is on the internet at bhat53f@vista-express.com. Drop him a note! All four men went on in their Air Force careers and became field grade officers before retirement. Gene Chaney was still flying C-130Bs in the Philippines with the 463rd when I knew him in 1969-70. Bill Hatfield left C-130s and went to Charleston to become a MATS weanie as a squadron commander of one of the first squadrons to fly C-141s. (He could no longer sing his favorite song "I'd Rather Have a Sister in a Whorehouse, Then to Have a Brother in MATS"!) He commanded an Air Rescue HC-130 squadron in Vietnam and in the US. Many of the other crewmembers also remained in the Air Force. Billie Mills, who was a copilot on a Horsemen crew, was a major in the 463rd Stan/Eval at Clark in 1968. He was one of the AC's who put the capabilities of the C-130 to the test when he landed his B-model at Kham Duc and brought out a load of refugees on what was one of the most dramatic days in airlift history. The legacy of the Horsemen was memoralized in the squadron patch for the 774th TCS. In addition to the squadron's original green weasel (which led to the Horsemen calling themselves the "Thunderweasels," a red lightning bolt was added to signify the Horsemen's legacy with the squadron. A film about the Horsemen was made during the 1950s; copies are still around in the hands of people who love the Herk.